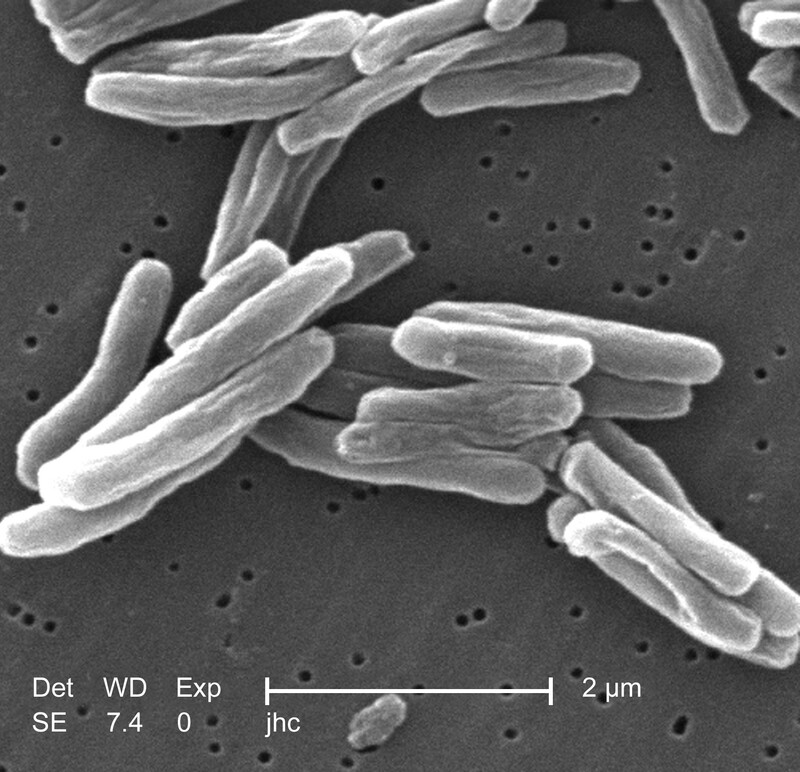 Tuberculosis—a disease caused by bacteria—has plagued human beings for millenia. Studying spinal-column fragments of Egyptian mummies, scientists have found signs of tuberculosis on people who lived as early as 2400 BC. At the time Edgar Allan Poe was writing in America, TB was called "consumption." The source for that is a Greek word—phthisis (THI-sis)—which means "consumption." Writing around 460 BC, Hippocrates—the "father" of medicine—identified phthisis as the most widely spread disease of his time. In addition, he observed that it was usually fatal. The bacteria which causes TB—known as "Mycobacterium tuberculosis"—spreads from person to person through the air. The act of spitting, sneezing, coughing or even talking can send bacteria (stained red in this photo) out of an infected-person's body. Those TB germs then "catch a ride" on expelled droplets which can dry into tiny particles called "droplet nuclei." Droplet nuclei are able to remain suspended, in the air, for relatively long periods of time. Without even knowing it, other individuals can breathe-in those tiny particles which are infected with the TB bacteria. Although this educational film may seem a bit strange to modern viewers, it is helpful in understanding how the TB bacteria works inside a person's body. The illness can be spread by individuals who are not even aware they are infected. If the importance of a disease for mankind is measured by the number of fatalities it causes, then tuberculosis must be considered much more important than those most feared infectious diseases, plague, cholera and the like. One in seven of all human beings dies from tuberculosis. If one only considers the productive middle-age groups, tuberculosis carries away one-third, and often more. Clip from "Goodbye Mr. Germ," produced in 1940 by the National Tuberculosis Association, online courtesy Internet Archive. Bos, Carole "Consumption - Tuberculosis and How It Spreads" AwesomeStories.com. Oct 07, 2013. Apr 18, 2019.